Royal Sussex Regiment 2nd Bn. Son of Thomas G. and Clara Taylor, of "Winkworth," High St., Banstead, Surrey. 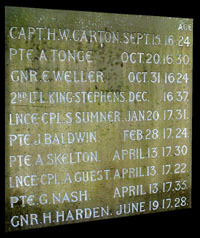 Memorial Reference: Panel 86 to 88. 1901 census; Source Citation: Class: RG13; Piece: 578; Folio: 15; Page: 22. TO BE RESOLVED : FIRST NAME DISCREPANCY. Resolved via 1901 census. Correct name is Albert. Son of Walter and Mary Ann Taylor,(nee Smith) of "Corbridge", Lyme Regis Rd., Banstead, Surrey. John William Taylor was the fifth son of Walter and Mary Ann. The other siblings were Walter, Thomas, Kenneth, Joseph, Elsie,and younger brother Fred. In 1901 the family lived at 17 Mint Cottages and Walter senior was a coachman. Private Taylor served with a Motor Transport Company. Often called Ammunition Parks, they operated dumps, or stores, of ammunition. This included the larger calibre of artillery shells which required special handling equipment, smaller shells, mortar rounds, grenades and small arms ammunition too. XIX Corps in the form of the 15th, 16th, 36th and 61st Divisions were involved in the Battle of Langemarck, a village north east of Ypres in Belgium. The battle took place over three days - 16th to 18th of August 1917. Private J W Taylor died on the 18th or the following day and it is likely that he was wounded during this phase of the Third Battle of Ypres and lost his life shortly afterwards. It may seem strange to describe this event as 'fortuitous' but it is almost certainly the reason that Private Taylor has a known grave unlike so many of his comrades. The immediate tactical aim of the offensive was the recapture of high ground from which the German artillery could observe and accurately bombard targets in the vicinity of Ypres which was in Allied hands. The exceptionally wet August weather had turned parts of the Ypres battlefield into a quagmire as many of the vital drainage channels of this low-lying area of Belgium were completely destroyed by the British and German shelling. The whole area turned into a sea of mud and blood that became known as Passchendaele, named after a local village where some of the heaviest fighting took place. The attack to capture the village of Langemarck from the Germans was masterminded by the British commander in chief Sir Douglas Haig. He was reportedly unaware of the heavy rains and thickening mud which bogged down the Allied infantry and artillery and despite advice to the contrary he proceeded with the planned offensive. On August 16, at Langemarck, to the west of Passchendaele, four days of fierce fighting resulted in a British victory; the number of casualties was very high in proportion to the small gains made. By the time their son was killed, Walter and Mary Ann Taylor had moved to 'Corbridge', Lyme Regis Road, a property that they were able to buy using money sent home by their sons. WHITE HOUSE CEMETERY, ST. JEAN-LES-YPRES, Belgium. Family history from Gill Marlow, grandaughter of Walter Taylor (junior). 10th (Prince of Wales's Own Royal) Hussars. All Saints Church Garton Memorial, Banstead, Surrey. ALL Saints Church Wood Panel. .
London Regiment (London Scottish) 14th Bn. Son of James and Betsy Ann Tonge, of the Post Office, High Street, Banstead, Surrey. Railway records show that Archibald worked as a clerk in the Registration department earning 51/6 (51 shillings and sixpence, now just over £2.50 a week). He left for active service on the 15 March 1914. The final entry on the railway register shows "Killed in Action". Grave Reference: III. J. 5.